There were history and other narrative painters in the late 1800s who did not see the need to re-invent history painting in the way that Gustave Moreau did. One of the best and most enduring – if still little-known – was JW Waterhouse. Born in Rome to parents who were both (minor) British painters, the family returned to live in London in 1854. Encouraged into drawing and painting, he entered the school of the Royal Academy of Art in 1871, initially as a sculptor, as he had failed entry for painting. With a traditional and classical education in painting, he had his first work accepted for exhibition in the Royal Academy Summer Exhibition in 1874. His early work was classical, Salon-style along the lines of Alma-Tadema and Lord Leighton, but he became more painterly over time. He showed paintings at the Royal Academy almost annually, until 1916, with increasing success. He taught at the Saint John’s Wood Art School, and was elected to the Royal Academy in 1895. He is often considered to be a ‘third-generation Pre-Raphaelite’, but his loose brushwork was quite distinct from the work of the Pre-Raphaelites, who also long preceded him. This late painting, and the next much earlier one, are two of the three paintings by Waterhouse which are based on the poem The Lady of Shalott by Alfred Lord Tennyson (1809–1892), published in 1833 and 1842. This recounts part of the Arthurian legends, that of Elaine of Astolat, as retold in an Italian novella from the 1200s, from which it gets its title. 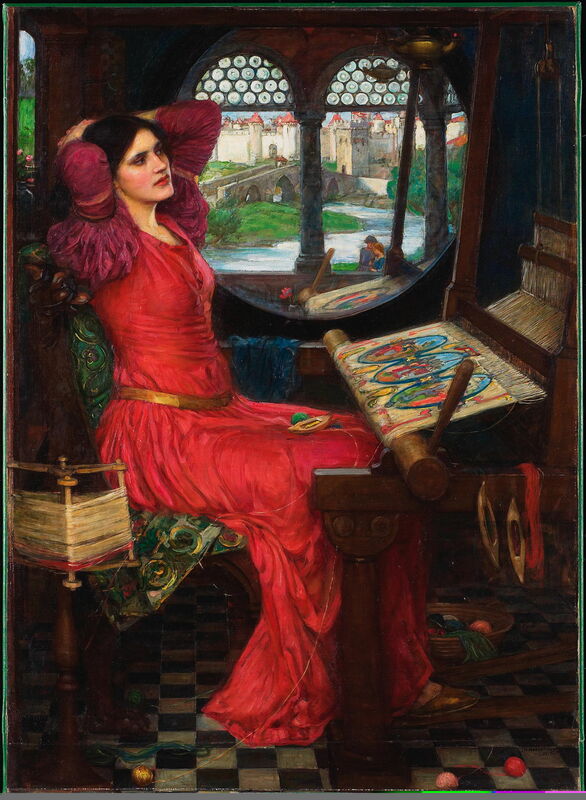 Waterhouse shows a scene which is remarkably faithful to the poem: the Lady of Shalott sits looking wistfully into the (interior) distance, in front of her loom, on which she is weaving images. What appears to be a window behind her is actually a very large circular mirror, reflecting the view of the outside which must be behind the viewer. This cleverly brings the viewer into her world, without showing the viewer in the mirror. She is surrounded by additional objects which provide abundant cues to what she is doing. In the (reflected) distance the river is shown running down to the large castellated palace of Camelot. The Lady’s facial expression and body language match the text perfectly, showing that he is following the classical approach advocated by Alberti and practised by Poussin and many others. In addition to the obvious links to the text narrative, Waterhouse has ingeniously made this fairly static scene a commentary on the reality of images, and of their reflections, which is common to Tennyson’s poem. The whole painting assembles a crisp reality from its very painterly facture. The colours are rich and intense, particularly the Lady’s dress and the images in her weaving. This much earlier painting depicts the climax of Tennyson’s poem. 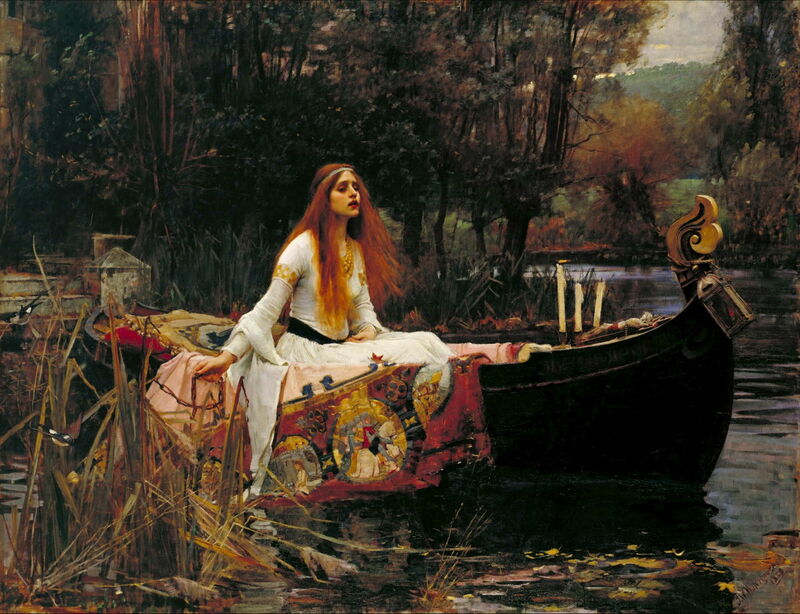 Waterhouse’s most famous painting is again a careful depiction of exactly what is described in Tennyson’s poem, even down to the naming of the boat. This time he dresses the Lady in a white dress which is cut to Arthurian expectations, with long cut-away sleeves, and a symbolically black belt. Her face shows the failing anguish and yearning of someone about to die as the result of a conflict between a curse and her desire for Lancelot, although she has limited body language. Draped over the side of the boat is an example of the images which she has spent her life weaving, a strong cue to the poem. This painting, much earlier in Waterhouse’s career, is not as painterly but is more strictly realistic in its style, although his colours are still intense in some passages, notably the Lady’s hair, and her weaving. 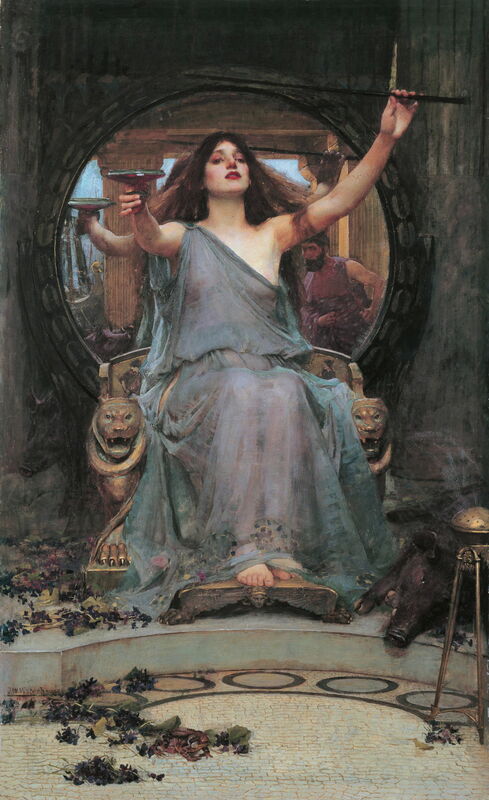 Greek mythology held that Circe was the goddess of magic, adept at all manner of potions and spells. According to Homer’s Odyssey, Odysseus and his colleagues arrived on her island, where she invited them to a feast, at which they drank wine which was laced with a magical potion, drunk from an enchanted cup. She then turned the men into pigs, apart from one who escaped and warned Odysseus and a few others who had stayed to look after their ships. Hermes, messenger of the gods, then told Odysseus to use a herb to protect himself from the effects of Circe’s potion. He should then draw his sword and act as if to attack Circe with it. Odysseus followed that advice, and was able to free his men, who remained on the island for another year, feasting and drinking wine. 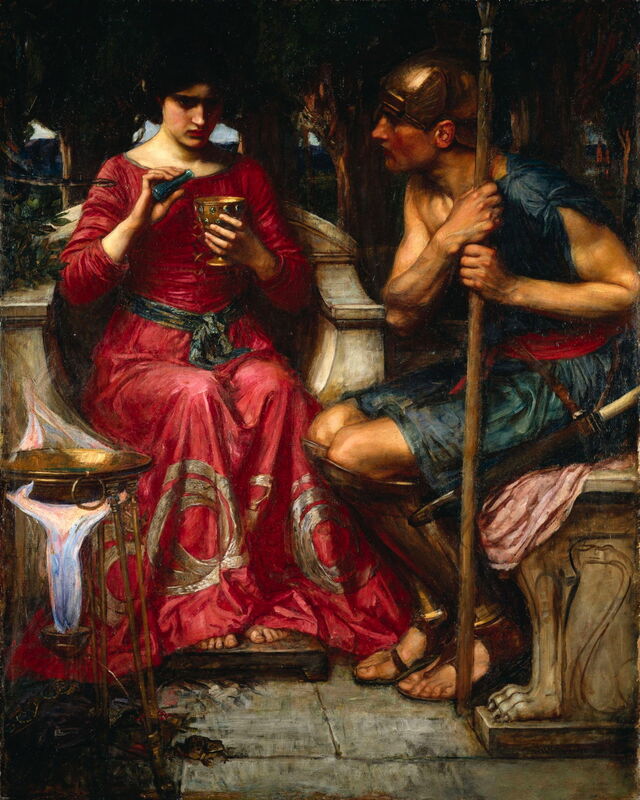 Waterhouse shows Circe quite true to Homer’s account, offering Odysseus the enchanted cup containing wine laced with her magical potion. Her facial expression fits this well, and her left hand wields her magic wand, ready to transform Odysseus into a pig. This is cued by the sight of a pig resting peacefully at Circe’s feet. Her right hand offers Odysseus and the viewer the enchanted cup. As in his first painting of the Lady of Shalott above, Waterhouse uses a large circular mirror to great effect, showing Odysseus reflected in the mirror, and once again putting the viewer (invisibly) within the painting. Scattered around Circe are various flowers and berries, as she might use in her potions. This is another story from the Homeric Odyssey (the Greek Odysseus and Latin Ulysses being identical). Circe had helpfully advised Odysseus/Ulysses that he would have to sail past the Sirens, two to five creatures who lured men to their death with their singing. In preparation, Odysseus got his sailors to plug their ears with beeswax before they reached the Sirens, so that they could not hear their song, and to bind him to the mast. He gave them strict instructions that under no circumstances, no matter what he said at the time, were they to loosen his bonds, as he would be listening to the Sirens’ song. As the group reached the Sirens, Odysseus instructed his men to release him, but instead they bound him more closely to the mast. Once they had passed safely from earshot of the Sirens, Odysseus used his facial expression to inform his men, who then released him, and they sailed on. Waterhouse’s depiction is quite close to the Homeric account, although he has provided a total of seven Sirens, very appropriately shown as a large eagle-like bird of prey with the head and neck of a beautiful young woman. He has added bandage wrappings around the head of each sailor to make it clear that their ears are stopped from hearing sound. This is a good example of a visual artifice which makes the cue to the text much clearer, even though it is not what is literally described in that text. There is relatively little opportunity to exploit facial expressions here, but the Sirens are clearly singing, particularly the one closest to the viewer, who is challenging the hearing protection of one of the sailors. Another sailor, at the stern of the ship (left of the painting), is seen clutching his ears, clear body language to support the narrative. There is some additional detail which does not appear in Homer’s original, particularly the fact that the Sirens were not described as coming out from the shore of their island to Odysseus’ ships, but Waterhouse’s gentle recasting of the scene serves its narrative strongly. It is likely that Waterhouse would have seen William Etty’s (1787–1849) celebrated painting The Sirens and Ulysses (1837), but wisely resisted its depiction of the Sirens as three beautiful and naked young women. This classical myth is known from Ovid’s Metamorphoses, Book III, and is the union of two conjoined narratives. In the first, Echo is a loquacious singing nymph who annoys Zeus’s wife Hera by tricking her into believing that her husband was around. Hera puts Echo under a curse, in which Echo is only able to repeat the last words spoken, and is unable to say anything else. 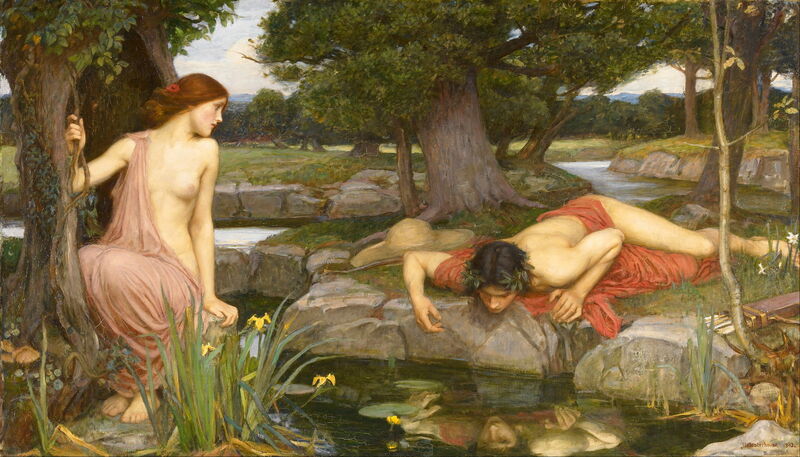 Echo then falls in love with Narcissus; when her presence is revealed to Narcissus, he rejects her. Aphrodite then makes Echo disappear, so that only her echoing voice remains. When Narcissus is tired of hunting and the heat, he pauses by a spring, and drinks from it. While drinking, he falls in love with his own reflection in the water. He wastes away with this self-love, his body being replaced by the narcissus flower. Although the story of Narcissus is very visual and popular with painters (see, for example, Caravaggio’s powerful representation), that of Echo is largely auditory and a much greater challenge. Waterhouse chooses to collapse the sequential stories into a single composite image, with Echo, spurned despite her beauty (which is explicit, unusually for this artist), whilst Narcissus is engrossed in staring at his own reflection. Narcissus comes with good cues which link to details in the text narrative: his bow and quiver of arrows, and the broad-brimmed hat associated with warm weather. At his feet there are also narcissus flowers. Although body language is used to good effect, Waterhouse does not overdo this by adding theatrical facial expressions. The painting, for all its realism, is very painterly. 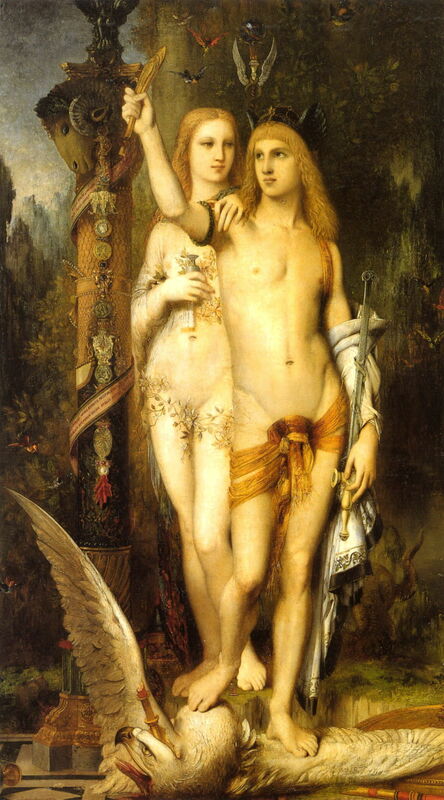 I have already shown and discussed Gustave Moreau’s version of Jason (1865) with Medea, shown below. This refers to the classical narrative of Jason and the Golden Fleece: when Jason reached Colchis, he underwent a series of trials imposed by King Aeëtes, culminating in Jason’s victory over the dragon which guarded the Golden Fleece. These were accomplished with the help of Medea, the King’s daughter, in return for a promise of marriage. Waterhouse makes quite different decisions from those of Moreau. The Golden Fleece, perhaps the strongest visual cue, is nowhere to be seen, suggesting that his painting depicts Medea preparing the potion which Jason later gives to the dragon guarding the Golden Fleece. Medea wears a dress which suggests, in its bold icons, her role as a sorceress. In front of her, a flame heats ingredients for the potion, which she is adding to a chalice. Jason appears anxious, and is dressed and armed ready to go and fight the dragon. Although quite faithful to the text, this scene occurs during the build-up to the climax of this story, and is only weakly dramatic. Facial expressions and body language are appropriate but not exaggerated. 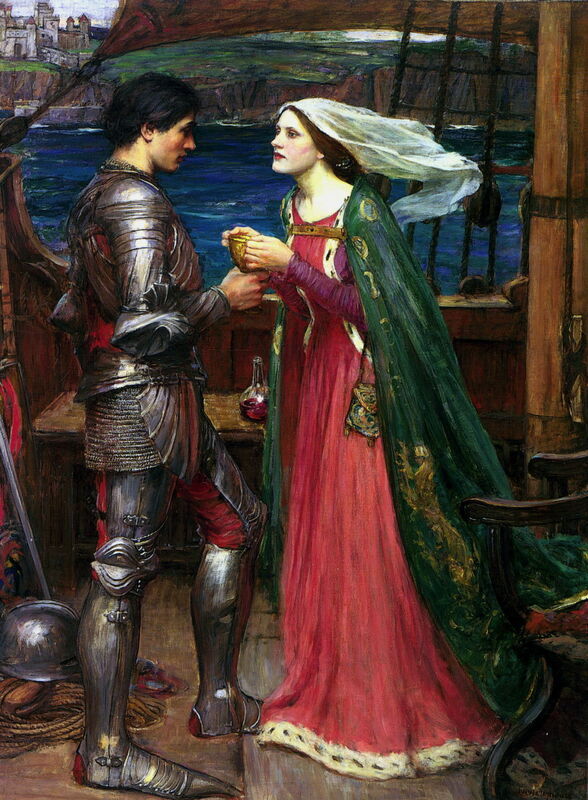 The tragic adulterous love between Tristan (Tristram) and Iseult (Isolde, Yseult) is thought to have originated in an ancient Persian story, and possibly Celtic legend, and was then retold in French mediaeval poems, and again in Arthurian legend, as Lancelot and Guinevere. In its essence, it consists of a love triangle. Tristan, a Cornish knight, is successful against an Irish knight, then goes to Ireland to bring Iseult back for his uncle, King Mark, to marry. However Tristan and Iseult fall in love as a result of a potion which they have both taken. Eventually King Mark learns of the affair, and tries to entrap the couple. However this is complicated by war between Ireland and Cornwall, and at length Tristan and Iseult agree to disengage from one another. There are many variants, and different endings, some of which are inevitably tragic. Waterhouse again follows quite a standard and faithful pictorial account, of the couple drinking the potion from a golden chalice, whilst on a ship, presumably carrying them back to King Mark. They do not have particularly strong facial expressions, and their body language indicates the beginning of their romantic involvement. Both are dressed in role, and in the spirit of popular images of Arthurian legends. Unlike Gustave Moreau, Waterhouse does not appear to have had any disagreement with conventional and classical approaches (Alberti) to the depiction of narrative in paintings. Although he seldom used facial expression as a strong element, body language is usually clear, and that expected, and he provides ample supporting cues to the text narrative. It is interesting to see his more painterly style, and use of rich colour. Some have suggested that this is impressionist, but I think that would be exaggeration. It is, though, appropriate to his time relative to the changes wrought by Impressionism. Overall I think that his narratives work well, although by that time they had to compete with spectacular panoramas, and the beginning of the movies: tough competition indeed. Posted in General, Painting and tagged Arthur, legend, Moreau, myth, narrative, painting, Pre-Raphaelite, Shalott, Waterhouse. Bookmark the permalink.